The Washington Heights Congregation has sold its West 179th Street home after 43 years. 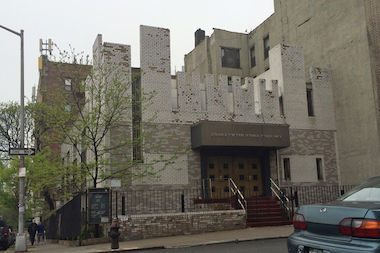 WASHINGTON HEIGHTS — The Washington Heights Congregation is moving north again. The Modern Orthodox Jewish congregation, nicknamed the "Bridge Shul," has sold its 179th Street synagogue after 43 years, the group announced. The 100-member WHC will move near 187th Street, to a smaller space on the lower level of the Mt. Sinai Jewish Center at 135 Bennett Ave. after selling the temple near Pinehurst Avenue at 815 W. 179th St. In a post on the WHC's Facebook group, board member Adina Gerver said the move from the WHC's brick building, which sits in the shadow of the George Washington Bridge, will be a beneficial one. "The leadership of Washington Heights Congregation believes that the decision to sell our building will serve us best both in the present and long into the future," Gerver wrote. The move to Bennett Avenue continues a historical northward trend for the WHC, which first purchased space for a synagogue on 161st Street a century ago. The WHC stayed there for 56 years before moving further uptown to its 179th Street synagogue, where it has been ever since. However, the synagogue has aged and repairs to the building became too expensive, WHC president Robert Wolf said. "We've been looking for a buyer for some time," Wolf said. "It was getting to a point where repairs were becoming more prohibitive." In that light, the sale should be viewed as a positive step forward for the WHC, Wolf said. "We hope to keep functioning. We have a new rabbi, Yaakov Hoffman, and there is leadership. We are very optimistic about the continuation of the congregation," he said. The WHC will hold a final Shabbat service in its current location the weekend of May 17. Terms of the sale were not disclosed and did not yet appear in public records.